The following wheel types were available for the 1980 - 89 Ford light trucks. Note that this does not mean that all types were available for all trucks each year. 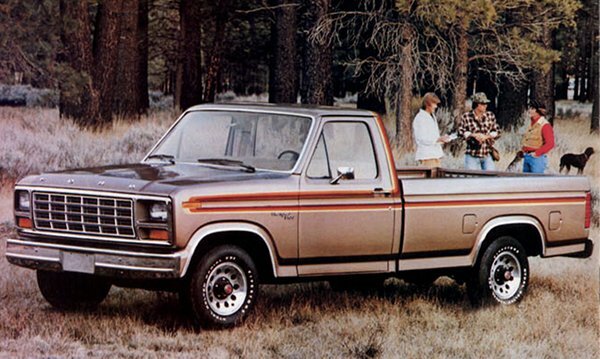 See the Application tab for which were used on the pickups and Broncos each year. The types of wheels that were used on the F-series pickups and U-series Bronco's are shown here by year. But, note that there is an omission in the chart for both 1980 and 1981. The 1982 chart shows that some F100's used a 5 x 4.5" wheel. But as you can see on the F100's tab on the Bullnose FAQ's page, F100's with power brakes and a GVW of 4600 to 4700 lbs used them from 1980 through 1983, the last year of the F100. So the chart below is incomplete as it doesn't include those wheels for 1980 and '81. Here are a couple of shots of D8TZ 1015-E, which is the wheel used from '78 through '81 on the Bronco's and F100's & 150's. Ford called these "10 openings - polished aluminum. They are 15 x 6" and have a 5 x 5 1/2" bolt pattern.